Dr. Park received his undergraduate degree from the University of Virginia. 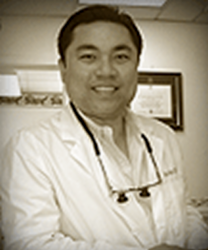 Since his graduation from the prestigious University of Pennsylvania Dental School, Dr. Park has been privileged to receive a post doctoral hospital fellowship at the University of Maryland Hospital as well as The Johns Hopkins University Hospital for his extensive focus on advanced, post-doctoral education including orthodontics, sedation, implants and oral surgery. He has been a resident of northern Virginia most of his life, is married and has two young sons.